When you think about countries that produce quality wristwatches, you usually think of Switzerland, or Japan, or perhaps the United States. Italy usually does not come immediately to mind, as there are relatively few watch manufacturers located there. 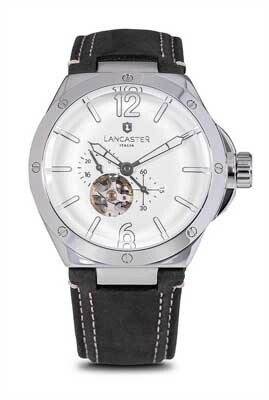 Lancaster watches, despite the non-Italian sounding name, are actually made in Italy. The company, which was founded in 1992, takes its name from an English manufacturer of wristwatches, makes its watches in Italy, and uses movements sourced from Japan and Switzerland. Add in some surprisingly diverse Italian styling and you’ll find that these watches are unusual, indeed. On the other hand, they’re well made and surprisingly affordable. Read on for the full Lancaster watches review. The build quality of Lancaster watches is good, with stainless steel cases and coated mineral crystal to protect the watch face. Straps are leather or silicone, depending on the model and other models have stainless steel bracelets. A few higher-end models include screw-down crowns. Water resistance ranges up to 100 meters for some models. Most watch manufacturers either design and build their own movements, or they use movements sourced from a single provider. That’s not the case here; they’re built in Italy, but they use movements from Swiss manufacturers Ronda and ETA, or from Japanese manufacturer Miyota, a division of Citizen. The company’s watches mostly feature quartz movements, but a few of their more expensive models feature Ronda mechanical movements. All are reliable movements that should run well for years to come. There’s not a lot of innovation to be found here, as they’re using off-the-shelf movements sourced from other manufacturers. They do have some chronographs, and watches with date complications. We saw one model with moon phases. Still, these watches are not about innovation; they’re about styling more than anything else. 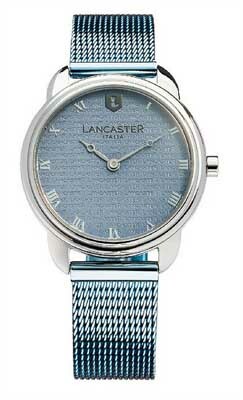 And that styling to be found in Lancaster watches is a bit unusual. It’s not that their styling is good or bad; it’s that their styling is all over the map. The company makes models for both men and women, and a few of the women’s models have gold-plated cases and diamonds in the bezel, but most of the women’s models that have visual bling have crystals, rather than diamonds. Most models are either time-only, or chronographs, with a few in between that feature date or day/date complications. Case sizes for men’s watches, especially chronographs, run to the large size, with cases of up to 48mm in diameter. Colors are available across the product line; they aren’t content to stick to gold, silver, black, and white when it comes to their watch faces or their straps. There are models with green and blue faces, and even a few with orange straps. Cases can be found in the usual round shape, a few are square, and a few are oval-ish. Models feature both Arabic and Roman numerals on the face. The Space Shuttle line of watches have a skeleton feature, so that you can see part of the movement as the watch runs. Care and maintenance will be minimal, as most of their watches have electronic quartz movements. For those models, you’ll need to have the battery replaced every three years or so. 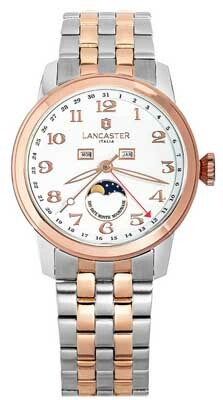 Mechanical models may require occasional service; we recommend contacting Lancaster watches for a specific schedule. Aside from these considerations, you should store your watch in a cool, dry place, and keep them away from strong magnetic fields. The warranty offered is two years from the date of purchase. This will protect you against defects in materials and craftsmanship. As these watches use well-tested, highly reliable movements from reputable manufacturers, defects are likely quite rare. 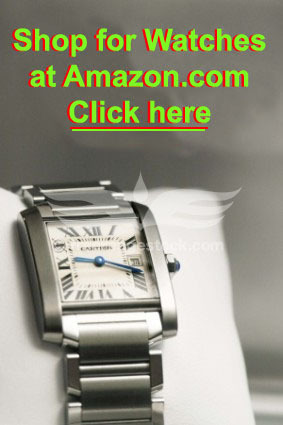 As designer watches go, you’ll find that the prices are quite reasonable. They start at a low of about $100, and run to as much as $2000 or so for a few limited edition models. Most models can be found in the $200-$500 range, which makes them quite affordable compared to premium and better-known Swiss brands. You can likely find them at discounted prices from a number of online retailers. We are not aware of any brick and mortar retailers who carry the brand, at least not in the United States. It’s possible that some retailers in Europe sell the brand. You can, on the other hand, find a number of retailers online who sell Lancaster watches, and you’ll find them at most of the larger retail sites, including a number of specialty watch sites. You can also buy them at the company’s official Website, though budget-conscious buyers may not want to start there. You’d likely find a better opportunity to buy discount Lancaster watches by shopping at one of the other online retailers who carry the brand. While there are watch manufacturers all over Europe, we haven’t encountered very many Italian watchmaking companies. These watches are made in Italy, and they’re designed there, but the company builds their watches using proven technology for the movements in using Swiss and Japanese movements from reputable manufacturers. Styling is varied and interesting, with watches that are sporty, elegant, and some just plain old fun. You’ll find a few watches with diamonds, but most are styled (and priced) more casually, making them a good buy for someone who is interested in a quality watch but who doesn’t want to spend thousands of dollars on it. Lancaster watches are still trying to figure out exactly where they fit in the market, and eventually, they’ll come up with a unified sense of styling that reflects the brand as a whole. In the meantime, they make some interesting watches that are well worth a look. Gray Market Watches - What Are They?